York Early Music Festival – York, England, 1992. The Chatham Islands Working in this amazing place with Youth week, art group and Te One school. Dusky Sound Trip An invited artist on a trip to Dusky Sound as part of a Department of Conservation project involving a multidisciplinary approach to the promotion and public awareness of Dusky Sound’s past, present & future. Hearts in Japan (invited artist) – my art ‘n mind shapes on display in Tokyo. Glenham Primary School visit – it was a real pleasure to welcome the whole of Glenham school – students, teachers & parents, from deep in Southland to my house where they explored the collections and conducted interviews with me! Working on paintings on location in Ireland, Germany and The Netherlands. Art in the Garden – painting on location within an orchard setting in Central Otago. Alexandra Community Arts, Alexandra, Central Otago, NZ. 3D Sculptures – working with a client group over an 8 week period. PACT, The Armitage, King Edward Drive, South Dunedin, NZ. Panning for Art – Gabriel’s Gully 150th – making a 3 dimensional art work. Working on paintings on location in Brisbane, Australia and Malaysia. Jubilee Exhibition (invitation group) Exhibiting two 4 metre long paintings celebrating 100 years of education in the Tuatapere and District schools area. Waiau College and Tuatapere Community College, Southland, NZ. Dished Up (invitation group) A fundraising exhibition of plates from artists around NZ. Ashburton Art Gallery, Canterbury, NZ. The Art Lovers Luncheon Guest speaker discussing the adventures of painting on location and the challenges and thrills of buying art. Southland Festival of the Arts, Great South Professional Artists’ Association, Invercargill, NZ. 50 Years 50 Artworks (group) Exhibition of the painted panels and artist’s work produced as part of the Artist in Residence programme at James Hargest College in Invercargill. Riverton Community Art Gallery, Southland, NZ. Shape of Things to Come (solo) A mixed media show, exhibiting expressive landscapes, Art ‘n Mind shapes and ceramics. Gallery De Novo, Dunedin, NZ. Riversdale Arts Annual Exhibition (invitation group) Exhibiting paintings of images from the local rural area. Riversdale Arts, Southland, NZ. Dunedin Rhododendron Festival Leading a painting workshop at the Dunedin Public gardens with Rhododendron blooms as the inspiration. Dunedin Rhododendron Festival Trust, Otago, NZ. Painting Down a Shingle Road (solo) Paintings of those out of the way places in South Canterbury, done from the back of the truck. Ashburton Art Gallery, Ashburton, NZ. Signify: Fashion/Art Collaboration (Selected group) New Zealand designers and artists working together to produce a wearable piece of art. A fundraising event for the gallery. Ashburton Art Gallery, Canterbury, NZ. Ocean View (Group) Works celebrating the southern ocean. Venture Southland May Arts Festival. City Gallery, Invercargill, NZ. Aspects (Selected group) As part of the May Arts Festival. Southland Education, WEA building, Invercargill, NZ. From across the Seas (Solo) Works celebrating my father’s journey from Holland to New Zealand in the 1950’s and the parallel story of my family’s history of breast cancer. Salisbury House Gallery, The Manse, 5 Smith St., Dunedin, NZ and Riverton Community Arts Centre, Riverton, NZ. Primary Schools’ Art Festival Working with 800 children in the construction of 7 large box installations as part of the celebration of children’s art in a rural area. Central Otago REAP, Alexandra, NZ. Artist Residency A 10 weeks residency at James Hargest College, Southland. Working on my own artwork as well as with students on 50 painted panels to celebrate the school’s 50 years. Funded by Ministry of Education, Wellington, NZ. Kiwi Sculptures Working with 120 school children on a Kiwi sculpture project involving making TVs, Kiwi light boxes, Kiwi swimming pools, and art books. Macandrew Bay School, Dunedin, NZ. Mural Tiles Working with both primary and secondary students on individual painted tiles that came together to make murals for the outside of the school. Roxburgh Area School, Central Otago, NZ. Banner Project Working with people who are supported by Supporting Families Southland on a large vinyl banner. Supporting Families, Southland, NZ. New Paintings from the MG (solo) 18 new paintings painted from the bonnet of the MG car in the winter months around Otago. Nevill Studios, Crawford St, Dunedin. NZ. On Location in Gore’s Backyard (solo) 16 new paintings done on location around Southland over a year responding to the green pastures and big skies. Eastern Southland Gallery, Gore, NZ. Art n Mind (solo) a large installation of a new series of works, using printmaking techniques on designed cut out shapes, eg. caravans and old cars. Gallery De Novo, 101 Stuart St. Dunedin, NZ. Journeys (solo) Works about the Dutch journeying over water to Aotearoa, using the old and the new country’s symbols. Art Wall, Shop on Carroll, Dunedin, NZ. Two Big Girls (with Pamela Brown) 6 Paintings around Central Otago and 12 Art ‘n Mind prints about the full moon. Packing Shed Gallery & Café, Bolton Road, Earnscleugh, Central Otago, NZ. Painting on location in the dry rural areas of Victoria, Australia. Working on paintings on location responding to the island culture, where the sea meets the land in Rarotonga, Cook Islands. Rhododendrons Workshop Teaching adults the art of painting large flowers on location in the Dunedin Botanical Gardens’ Rhododendron Dell. Rhododendron Festival, Dunedin, NZ. 3D Paper Sculpture Working with adults (mental health consumers and IDEA Services clients) on a large indoor paper mural/sculpture. Welcome In, Gore, Southland, NZ. Painting Workshop Working with members between 13 to 25 years old who support or live with cancer, on large paintings of their favourite things. CANTEEN, Dunedin, NZ. Journey’s Art Book Project Working as part of the Artists in Schools project, with 15 schools throughout Central Otago, making art books with students on the topic of ‘their journey to school’. REAP, Alexandra, Central Otago, NZ. Painting Workshop Teaching Adults exercises in colour and composition with acrylic paint in a studio environment. REAP, Alexandra, Central Otago, NZ. Art Book Project Working with a group of women making Art Books to enhance their literacy learning. Literacy Aotearoa, 110 Moray Place, Dunedin, NZ. Art Workshops. Teaching the art of outdoor painting of lakes and mountains in the Arrowtown area. Off The Wall Gallery, Arrowtown, NZ. Mothers Matter Art Piece Art workshop with mothers to create a joint art piece. ‘Mothers Matter Too’ seminar, Rainbow Preschool, South Dunedin, New Zealand. Art Group An ongoing art project (from 2005) working weekly with Women of Two Minds Art Group on individual and joint art pieces. Cara, PO Box 5803. Dunedin. NZ. Art- a meaningful activity A visual presentation of the artwork that a women’s art group have produced and the processes they have gone through to produce the art. As well as other art projects I have been involved in, with people with brain injury. TBI Functional Rehabilitation Conference, Christchurch, NZ. Unterwegs (with 2 other artists) 30 Black Forest Paintings, Out in Nature. Galerie Innenstadt, Lorrach, Germany. Across Borders (solo) Small Paintings from Germany, The Netherlands, and Viet Nam. Nevill Studios Ltd, 35 Crawford Street, Dunedin, NZ. Bloomers (solo) Paintings done on location of flowers. Moray Gallery, 55 Princes Street, Dunedin, NZ. New Works on Paper (solo) New paintings of the local mountains/lake. Artworks Gallery, Helwick Street, Wanaka, NZ. State of the Art (group) A Insulation using Art ‘n Mind prints about the NZ State House in a State House. 27 Hislop Street, Pinehill, Dunedi,. NZ. Large Art (group) Large landscape paintings. Cleveland Living Arts Centre, Dunedin Railway Station, NZ. The Edge of the World (group) Paintings of the Catlin’s area and Art ’n Mind Prints. Southern Districts Arts Trust, Catlins, NZ. Working on own paintings responding to winter in the Black Forest. (3months) Lorrach, Germany. Working with students weekly (from 2004) with diverse needs in making themed based art on the subject of the earth and space. Sara Cohen School, Dunedin, NZ. Box Project Painting young peoples individual portraits as part of their Christmas box project. Tullinger Hohe, Lorrach, Germany. Trust Book Project Working in the library on artist books for the Anna and John Caselberg Trust. At the Dunedin Public Libraries, NZ. Art Book Project Working with IDEA clients on individual art books. IDEA Services, Gore, NZ. Surfboard Painting Workshops Working with ‘Whine Waves’ surfing group and ‘Macandrew Intermediate School’ students on surfboard designs and painting for ‘Surfing Exhibition’. Cleveland Living Arts, The Railway Station, Dunedin, NZ. Summer School Teaching summer school students a variety of painting techniques for painting out doors. Otago Polytechnic, Dunedin, NZ. ‘Minerals to Arts’ Teaching the art of painting on the Canterbury Plains as part of the weekend art celebrations. ‘Minerals to Art’. Mt Somers, Ashburton, NZ. Portraits in the Environment Working with students on self-portraits within the school grounds. Roxburgh Area School, Roxburgh, Otago, NZ. Portrait Art Working with students on self- portraits and environments. Clutha Valley Primary School, RD4 Balclutha, NZ. Art Work Painting on-site for ’Breast Cancer Research Trust’. WanakaFest, Otago, NZ. Art Group Working weekly with ‘Women of Two Minds ’Art Group on individual printmaking projects. CARA, PO Box 5803, Dunedin, NZ. Art Camp Working with students in responding to the sea environment, in painting, ink drawing and art books. Macandrew Intermediate School, Dunedin, NZ. Art Camp Working with young adults on banner design and painting; and environmental sculptures. Child, Youth and Family, PO Box 1305, Invercargil,. Southland, NZ. Century Banners 12 stitched banners made by communities over Otago to celebrate 100years of Presbyterian Support Otago. PSO, NZ. Snail Mail Postcards from artists nationally and from around the world together with school student. A fundraising project to get artists in school. Macandrew Intermediate School, Dunedin, NZ. From Earth to Outer Space Work produced by students with diverse needs as part of the Artist in Residence project over the past year. Sara Cohen School, Dunedin, NZ. Celebrating the State house. 25 signed edition of T towels as part of the State of Art installation, exhibition. Dunedin, NZ. Long Skinny’s (solo) 12 paintings on location around the Otago area. Moray Gallery, Dunedin, NZ. Large Art (group/selected) 1 large painting done on location. The Cleveland Living Arts Centre, Railway Station, Dunedin. NZ. Artist in Residence show Coastline paintings together with students and contributing schools paintings, as well as painting insulation. Weymouth College, Dorset, England. New Works (solo) 15 paintings on location around the Southern Lakes area, as part of the Festival of Colour. Artworks Gallery, Wanaka, Otago, NZ. Working on own paintings responding to local coastline, as well as working with students on a large painted insulation. Weymouth College, Dorest, England. Working on own paintings responding to the local landscape, as well as working with women in an out door setting teaching the art of painting the Italian Landscape. Terradilei, Umbria, Italy. Working with students weekly over the year, with diverse needs in making art. Sara Cohen School, Dunedin, NZ. Post Card Workshops With the general public and community groups and their workers for the Snail Mail Exhibition. Otago Museum, Dunedin, NZ. Hokonui High Tops Project Workshops in making Art Books with (IDEA) IHC, Mental Health Services and Hokonui Runanga. Eastern Southland Gallery, Gore, NZ. Art Group Working weekly with ‘Women of Two Minds’art group on individual sculpture projects. CARA, PO Box 5803, Dunedin, NZ. ArtStore 25/25 mural made with older people who live and work at Taieri Court to celebrate 25th birthday. Taieri Court, Presbyterian Support Otago, Mosgiel, NZ. Art Workshops Teaching the art of out door painting in the Invercargill area. WEA Centre, Invercargill, NZ. Art Workshop for Parents as First Teachers Working with parents and caregivers on different art processes with young children. Cleveland Arts Centre, Railway Station, Dunedin, NZ. From Umbria to Dusky Sound Talking about my latest works, adventures and inspirations. Otago Museum, Dunedin, NZ. Adventures with Wine and Food Ombrellos’ Restaurant, Dunedin, Otago, NZ. Women of Two Minds An exhibition of art works created by women who have survived a brain injury. Cleveland Arts Centre, Railway Station, Dunedin, NZ. Portmanteau A shop/gallery with Pamela Brown. A theme based retail outlet for artists and makers of art objects. Port Chalmers, Otago, NZ. The Moose Series (solo) Ten works painted on mirrors, questioning if the Moose still lives in Fiordland – this work was done in response to the time spent down there on a boat. Artworks, Wanaka, NZ. Painted on Location, Large Canvases, Not from a Photograph (solo) 30 large painting of the wind, rain and snow landscapes. Cleveland Living Arts Centre, Dunedin, NZ. White (selected/group) Six Art n’ Mind prints celebrating winter – all the artworks in the exhibition were in the colour white. Cleveland Living Arts Centre, Dunedin Railway Station, Dunedin, NZ. Fiordland and Around (selected/group) Seven works painted on mirrors questioning if the moose still lives in Fiordland. Riverton Arts Centre, Riverton, NZ. Adam Portraiture Award and Exhibition (selected/group) One large portrait painted down south of Marg Sharpe. New Zealand Portrait Gallery, Wellington, NZ. Working with students in printmaking, sculpture, weaving and painting at Sara Cohen School, Dunedin, NZ. Painting on location as part of ‘Art in the Garden’. Black Ridge Vineyard, Conroy’s Rd, Alexandra, Central Otago, NZ. 50th Anniversary Art Project Working with volunteers, residents and staff capturing reminiscences and tributes to Iona Home & Hospital. Enlarged poster sized letters feature stories and images, which are hung on painted walking sticks. Iona Home & Hospital, Presbyterian Support, Oamaru, NZ. ArtStore Working with residents and local community to create title wall mural at Elmslie House, Home & Hospital. Presbyterian Support Otago, Wanaka, NZ. Art Camp Working with students in a mountain and lake environment painting on location, creating sculpture, film and self- portraits. Macandrew Intermediate School, Dunedin, NZ. Painting workshops Sharing skills and techniques in using acrylic paint. WEA Centre, Invercargill, NZ. Art on Quarantine Island Workshops about painting on location, held on an island in the middle of Otago Harbour. Cleveland Living Arts Centre, Dunedin Railway Station, Dunedin, NZ. Rhododendron Painting Workshop on painting flowers in the Dunedin Botannical Gardens. Dunedin Rhododendron Festival, Dunedin, Otago, NZ. Exhibitions included – ‘Hearts and Flowers’, ‘Lamingtons’ and ‘Friends’. Port Chalmers, Otago, NZ. Murihiku-The South Land (selected/group) 3 paintings out to sea. An Exhibition of works about the lower part of the South Island. Eastern Southland Gallery, NZ Touring Australia and New Zealand Public Art Galleries. Interpretation of Aubrey Works (selected/group) An exhibition of contemporary work in response to Christopher Aubrey’s paintings of Riverton dated around the 1870’s. Riverton Community Arts Centre, Southland, NZ. Art n Mind (solo) a series of works using printers’ ink and roller. Work done while ‘Artist in Residence’ at Macandrew Intermediate. Moray Gallery, Dunedin, NZ. Macetown and Around (solo) 13 paintings done on 4 x 4 trips into the old gold mining areas of the Arrowtown area. The Lakes District Museum and Gallery, Arrowtown, NZ. Dunedin Group (group show) Six southern landscapes painted on location. Statements Gallery, Napier, NZ. 110th Women’s Suffrage Day Exhibition (group show) Ten works in the Art’ n Mind series. Cleveland Living Arts Centre, Dunedin Railway Station, NZ. South (group show) Ten paintings of Canterbury landscapes done on location. Ashburton Art Gallery, Canterbury, NZ. Two Big Girls on Holiday (with Pamela Brown) 30 southern landscapes done on location. Riverton Community Arts Centre, Riverton, NZ. HIV/AIDS Exhibition (Group) Six Art n’ Mind Prints about the misconceptions and stigmas attached to people living with HIV/AIDS. The Cleveland Living Arts Centre, Otago, NZ. Art Banners Working with students from Ashburton College art students on the production of 6 large banners for the outside of the Ashburton Art Gallery and Museum. Art Gallery & Museum, Ashburton, NZ. Art Workshop Painting flower workshops for the Dunedin Rhododendron Festival. Dunedin, NZ. Guitar Art Made lamp painted guitar for Artsenta as part of the ‘The Coldplay Guitar Auction’. Dunedin Public Art Gallery, Dunedin, NZ. Monteiths Wild Food Creating theme of ‘Central Otago Rabbiting’ for the food festival. Making all the props. Ombrellos, Dunedin, Otago, NZ. Our Art by students of Sara Cohen School. Cleveland living Arts Centre, Railway Centre, NZ. Arty Pants Day Speaking on community arts for the Rural Women’s Network. Telford Rural Polytechnic, Otago, NZ. Exhibitions include: The Bag Show, The Sea show, On the Road. Port Chalmers, Otago, NZ. Rakiura (Selected Group) The Exhibition toured New Zealand from 2000 to 2002. Landscapes and seascapes painted from the boat. A celebration of NZ newest National Park, A partnership between Southland Art Foundation, Department of Conservation and Southland Museum and Art Gallery. South (selected/group) 6 paintings painted on location in the south of the South Island. Ashburton Art Gallery, Baring Square East, Ashburton, NZ. New Southern Paintings (solo) 18 paintings painted on location in all weather in the south of the South Island. Artworks Gallery, Wanaka, NZ. Janet de Wagt Around Dusk (solo) 30 paintings painted from the boat and on location in the bush. Cleveland Living Arts Centre, Dunedin Railway Station, NZ. From All Angles (solo) 25 paintings that were painted on location with the canvas board made at different angles eg they fitted around corners. Nevill Studio Ltd, Crawford St, Dunedin, NZ. Calendar Project Celebrating the stories of volunteers who work at the warehouse and opportunity shop. Presbyterian Support Otago, NZ. ArtStore Working with the local community and residents on a memories art project. Taieri Court Rest Home, Presbyterian Support Otago, NZ. Highway Mural Working with harbour-side schools on the design and overseeing the project. Painted pictorial map with help from other artists, 100-metre mural. State Highway 88 Beautification Trust, Port Chalmers, NZ. Working with students in printmaking, sculpture, weaving and painting. Sara Cohen School, Dunedin, NZ. Working with residentson their painting projects during a 3-month fulltime residency. St Andrews Home and Hospital, Presbyterian Support Otago, Dunedin, NZ. Opened Shop/Gallery with Pamela Brown. A theme based retail outlet for artists and makers of art objects. Port Chalmers, Otago, NZ. Two Big Girls All At Sea (with Pamela Brown) 41 paintings done on location together with a series of NZ lighthouses painted on clay. Community Art Gallery, Dunedin, NZ. Getting Intimate with Stewart…Island (solo) 20 Small paintings on paper done on location on Stewart Island. Printmakers Studio, 6 Castle Street, Dunedin, NZ. 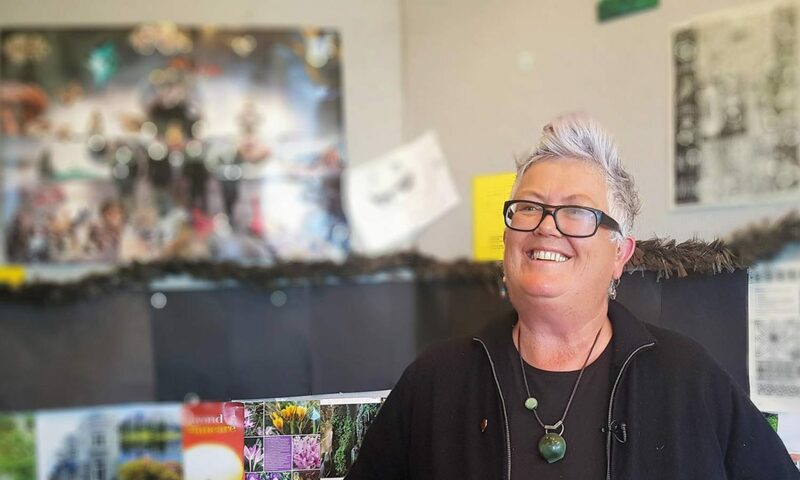 Art N Mind Project Working with communities in Otago and Southland on a four- month art residency promoting wellness through art. Working in schools, community centres, and hospitals. East Southland Gallery, Gore, Southland, NZ. ArtStore A memories art project. Working with Helen Frizzell (oral historian) over 10 weeks with the general public. St Andrews Home and Hospital, Presbyterian Support Otago, Dunedin, NZ. Totara Calendar Project Working with Residents on their life stories for a two-year art calendar. St Andrews Home and Hospital, Presbyterian Support Otago, Dunedin, NZ. The Vision Art Cargo & Load Project Working with local schools, community groups and 300 contributing artists. Port Chalmers, Dunedin, New Zealand.